I don’t get to have lunch in town often as I don’t work in town and finding parking is an absolute mission. A little while ago I heard about a new place called the Soupa Cafe which offers a curbside pick up service so you don’t have to find parking. It’s a pretty novel idea, so I thought I would test it out. I chose a rainy day (yes, I do have a nasty streak) and phoned through an order. It turns out they are very flexible with the menu, allowing you to have a wrap that is half chicken and half beef or to even mix two soups together! I found out that the curbside pick-up was not the only novel thing on offer, they also have a soup bunny! 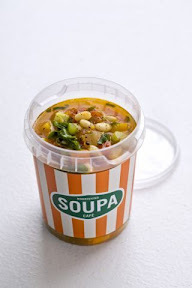 I had to give that a try so I ordered a Soupa Bunny with Mexican bean soup (350ml – R27.50). I also ordered an Asian beef wrap (R26) and a berry smoothie (500ml – R21.50). I drove into town 15 minutes later and there was someone from Soupa Cafe standing on the side of the road as promised, he was easy to spot in bright orange. Fortunately for him, it had stopped raining by then. When using the cubside pick-up service, they will tell you the bill total so you can pay for the order when you receive it. If you need change, you just tell them what change you will need and they will have it with them. Back at the office I unwrapped my lunch. The soup bunny is very interesting, it comes with a bowl made of bread. It’s baked in that shape so it can hold the soup for up to an hour before it becomes too soggy. I really enjoyed the bunny, the bread bowl was crunchy like ciabatta crust and my Mexican bean soup was great. The beef wrap was a bit plain. The menu mentions an Asian dressing but I think they might have left mine off. Also, the wrap itself was a bit heavy, not like the awesome wrap at Buzz Cafe. The berry smoothie was berry nice. If I worked near Thibault Square, I would probably add Soupa Cafe to my list of lunch options. I’ve heard that the lunch experience can be a little slow, but perhaps that will improve over time as they get their systems right. My experience with the curbside pick-up went smoothly, but it’s still a mission for me to go driving off to fetch lunch.